The reason many water pipes burst is because water expands as it freezes. If this expansion occurs in a closed environment such as a water pipe, there could be substantial pressure placed on the inner walls of the pipe material, whether it be iron, lead or PVC plastic. Even if a pipe is strong enough to handle the occasional stress of frozen water, the cumulative effect can weaken the structural integrity of the pipe and eventually, it will burst. Beware the unexpected cold snap or deep freeze. 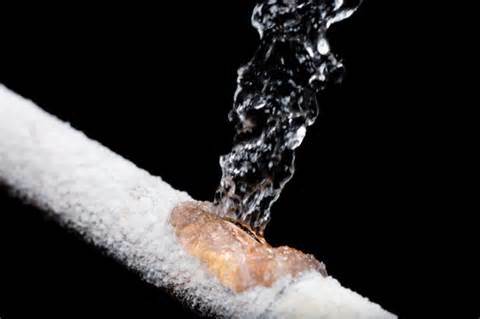 Frozen water pipes are a serious risk during very cold winter weather. When water freezes in a pipe it expands and can exert pressure over 2,000 pounds per square inch. This pressure is enough to rupture most any pipe filled with water which provides no place for the ice to expand. When the pipe bursts it will spill several hundred gallons of water per hour, and that equates to thousands of dollars of damage to your home. Frozen But Not Burst? Then It's Time to Thaw! In the situation where your pipe is frozen but not yet ruptured, you need to promptly thaw it out. What are some signs that you need this service? The tell-tale sign that you have frozen pipes is little to no water pressure when you turn on your faucet. A slightly bulging or fissured pipe is another indication that you most likely need pipe thawing services. Pipes should be thawed right away to prevent them from cracking and bursting, causing severe water damage to the home. Once you have identified a pipe that may be frozen, immediately turn off the water valve to prevent any potential leaks that could result in a burst. The first step to thawing your pipes is turning off your water supply. There are many methods to thawing out your pipes, but to get the job done properly, it is wise to consult a professional, especially in the case of a possible burst. In most cases homeowners have no way of accessing these pipes, but we use electric pipe thawing machines to provide instant heat to the pipe and loosen up any ice that has formed. Allow a small trickle of cold water to run from your faucet. This will keep water moving in your pipes, preventing freezing. Open under-sink cabinet doors to keep warm room air circulating around pipes. External openings such as basement doors, windows and crawl spaces should be sealed with weather stripping, caulk and sealant. Insulate external and exposed pipes with pipe insulation. Take the time before the first freeze of the season to drain out the sprinkler system. Disconnect, drain and store all hoses and exterior water spigot. If there is no water flowing from your faucets at all, you most likely have frozen or burst pipes. Many times, the exterior of the pipe will be frozen as well. If you know that you have a frozen pipe, take these measures to begin the thawing process. Open a faucet to allow melted water to flow through. Wrap towels soaked in warm water around the pipes. Using a hair dryer or space heater, heat the air surrounding the pipe. Do not directly heat the pipe, especially with an open flame.